Earth to Andy – This is a criminal trial and you’ve been ordered by the court to hand over all evidence to the prosecutor. Holding out a few slips of paper because you claim your supporters “don’t trust” the court is basically contempt. Not only could you be cited and fined for withholding evidence, but you could actually find yourself in jail prematurely simply for refusing to comply with Judge Connors’ order. Furthermore, any evidence which you fail to hand over to the prosecution will not be admissible at trial, but you probably already knew that right? To: Mr. Lyon & Xtagged owners. Allen Brady told me that he delivered my bundle of evidence Xtagged, Inc. papers etc.03/21/2013 exactly one year after the plaintiffs committed massive perjury on the stand. http://youtu.be/Hgxf10J-Vo0 <<<—– Video evidence of plaintiffs committing witness tampering. Look below how Ryion signs off! Please keep in mind Mr. Lyon that the evidence bundle I gave you does not have evidence from all 11 other Xtagged owners until trial they don’t trust you guys because of Holje & Albrights lies but they will be at trial with videos. Steve Klemark bought Xtagged.com in 2009 and Holje nor Albright ever contacted Steve, Rebecca Dunn Xtagged CEO 2009-2011 she has never been contacted. I am going to request new pretrial date asap now that you have seen 2008 Xtagged, Inc paperwork all legit and proof of perjury & witness tampering on behalf of the plaintiffs & Daryl Acumen. I believe if this case is not dropped asap I can asked the judge to move this trial to another court based on my evidence of extreme prejudice. hearings? Why is it that nobody’s ever seen this mythical “Xraza-phone” that Andy claims to use to send these emails and if there is a such thing as an “Xraza-phone”, then why did he lie to Judge Connors and tell the court he “don’t carry no phone”? Why haven’t we hard from Steve Klemark in ages except through fake Linked-In profiles and secondary references from Andy? 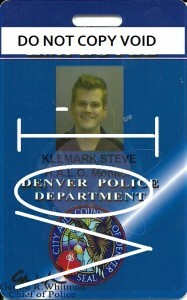 Is the Denver Police Department really ok with Andy showing off scanned copies of Steve’s security badge to promote his own criminal activity? In other news, Andy has a hearing tomorrow at 3pm with the Jefferson County Court in which he needs to explain why he has failed to comply with a lawful order to pay child support. As I write this, Andy owes over $20,000 in back child support for the first two of his six children and hasn’t made an effort to find a job so that he can pay the amounts which he continues to owe monthly. Andy asked for tomorrow’s hearing to buy himself more time since he has no intention of seeking work, but he has no grounds on which to argue for a reduced payment or a reduction in the amount he already owes. IN fact, Andy’s child support liability was based on minimum wage employment specifically because the court was unable to verify ANY kind of legitimate employment for Andy in the last ten years. Andy’s continuous threats of legal action and “jail” made repeatedly to members of the Colorado Child Support Enforcement office which is handling this case have not deterred the state’s attorneys or impressed the judge. For an overview of the child support case proceeding against Andy, click here [PDF].